The first thing worth noting about Innocent Sorcerers is that it looks simply stunning. Transferred from a new high definition restoration, approved by the director, the image quality is crisp, the sound pitch perfect, showing off the film’s gorgeous greyness to full effect. The platinum crop of central character Andrzej (Tadeusz Lomnicki) literally shines with silvery greatness – signalling him as the hippest of the films cast of free-spirited youth. In a new interview the film’s director, Andrzej Wajda – he tells of how impressed he is with new restorations of his films, describing how he barely recognises them as his own work. The freshness of Innocent Sorcerers is just one of the films many achievements; centring on the aforementioned Andrzej – a recently graduated sports doctor by day and Jazz drummer by night – Wajda depicts the life of the post-war generation in Warsaw. Untrammelled by a war they were too young to fight in, instead their rebellion is against the State’s imposed conformity and involves carving out a more independent lifestyle. Andrzej has seemingly no trouble finding female company but when his friend asks him to talk a woman on his behalf he is still surprised that Pelagia (Krystyna Stypulkowska) is willing to accompany him back to his apartment after she misses her train. Matching his attempts at seduction with quick wit at every turn, Pelagia is both charming and more mature than the women Andrzej is used to meeting. Deciding they should define the boundaries of their evening together, the two create an agreement of the night’s interactions and pin it to the wall. 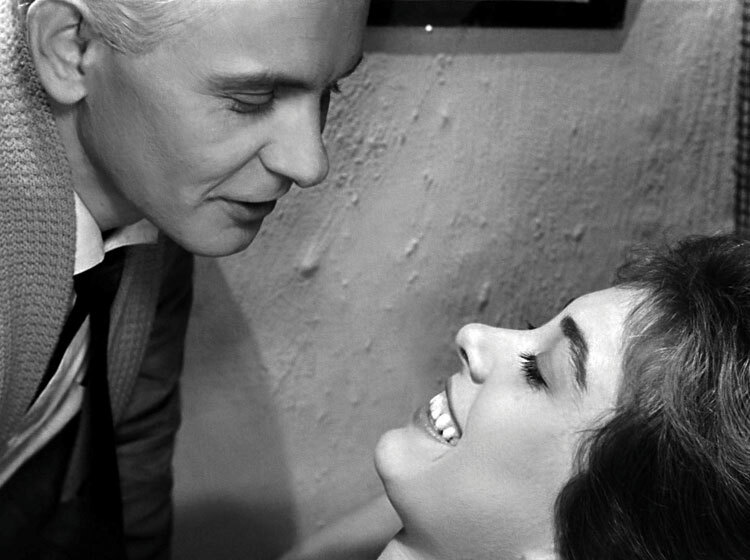 Depicting young people in this way was not familiar territory for Wajda. In the aforementioned interview he describes the emergence of the Polish Film School, a term coined by French critics that came to represent the endeavour of directors, writers etc. such as Wajda to tell stories about only one subject – what they had been through in the war. Feeling the guilt of surviving when his friends did not, Wajda’s previous features, A Generation (1955), Kanal (1957) and Ashes and Diamonds (1958) are cited as his attempts to depict their experiences. The attempt to represent the current, younger generation did not come as easily however, and required the experiences of one such hip, emerging artist to inform the authenticity of Innocent Sorcerers – Jerzy Skolimowski. At the time he was an aspiring poet – hired to co-write the script, he also appears as a boxer, a sport for which he had particular enthusiasm. Skolimowski’s small part demonstrates a vital energy – his is just one of many bright performances throughout the film and indeed leads Stypulkowska and Lomnicki have a chemistry that supports the majority of the running time. Pelagia, with a wry smile, enlightens Andrzej (or ‘Bazyli’ as he names himself as the beginning of their agreement) on the defining characteristics of their generation – that in all their assuredness; in fact they know nothing of the world. Innocent Sorcerers is a film constructed within its own cinematic world – opening on one of Andrzej’s lovers strolling in front of a poster for the film, we also hear a song on the radio announced as being from the hit film we are watching, not to mention a gorgeous close-up of the jazz club singer staring directly into the camera as she croons, “You enchanted my eyes, You enchanted my heart, Your sorcery Enchanted my world” – perhaps a delirious ode to the illusionist power of cinema. Accompanying Second Run DVD’s release is a new essay by Michal Oleszczyk in which he notes that Godard’s Breathless (Á bout de souffle) was shot at the same time as Innocent Sorcerers – a perfect coincidence of two films concerning ‘rebellious’ youth simultaneously coming to fruition, creating separate portraits of the French and Polish post-war generation. What a fantastic double bill that would be. Harriet, when are you going to have your own TV programme? This definitely makes me want to watch the film. . .